For generations, and what feels like an eternity, the Cubs have always played second fiddle to their division-rival St. Louis Cardinals. Anyone could have said, “Okay, last year’s NLDS was a fluke,” and that’s all well and good. But if there was any indicator that the Cubs were tired of being any team’s whipping post, the Jason Heyward signing is your indicator. Just as Theo Epstein did in Boston when they were the Yankees’ “little brother,” he’s doing now with the Cubs, ensuring that by no stretch of the imagination will the Cardinals ever be able to have an upper hand on them as long as he’s in charge. The NLDS victory was just one domino to fall in this philosophy, but another substantial one just did in the Heyward signing. St. Louis had him, but they let him go, because the Cubs came up with a more significant offer. And they just signed a guy that has potential to hit 30 home runs in a season. But the power is insignificant, courtesy of bats like Anthony Rizzo, Kris Bryant, Kyle Schwarber and, if he’s still around, Javier Baez. Heyward makes the Cubs a better team defensively (he posted an absurd UZR of 22.6 in 2015) and on the basepaths (7.0 BsR in 2015), and he’s still only 26. 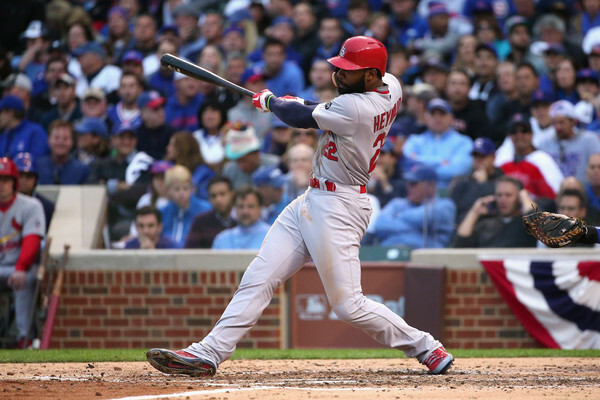 Beyond symbolically ruining the offseason of the Cardinals by taking Lackey, Zobrist and now Heyward away from them, the Cubs have the all-around player they’ve needed to improve themselves. Barring unforeseen setbacks like injuries or other circumstances, the Cubs have just cemented their place as the best team (on paper) in the National League. They have two aces (Lester and Arrieta) in the rotation. They have legit stars in the lineup (Rizzo, Bryant and Schwarber). They filled the holes they needed from last season’s already-impressive 97-win campaign (Lackey and Zobrist). There’s talk they’re still looking for another pitcher, which may make Baez or Jorge Soler expendable. But adding a Tyson Ross, Carlos Carrasco or Danny Salazar to that rotation makes this team otherworldly, even if it costs them Baez or Soler. That’s breathtaking, and the Cubs are in an enviable position where one of those pieces can be moved to completely solidify the starting rotation. I’ll have enough time in the coming months to swoon over the Cubs in 2016, but here’s one fact: the outfield market, possessing the likes of Yoenis Cespedes, Alex Gordon and Justin Upton, is now open. Heyward signing in Chicago doesn’t mark the end of the offseason marathon, it only signals the beginning of another leg of it. Sit back and enjoy more rumors and more heat on the stove, because the rest of this month should be an absolute thrill.